Yesterday's post was such fun. Well it was for me, at least. I'm sure it was no fun for you to have to wade through 15-plus questions about yours truly - but it sure was fun for me to read your responses. I know that a lot of you are busy and don't have time to sit down and type out long responses to my posts, let alone answer a pop quiz (what was I thinking!) - but I wanted to say that I really do appreciate the comments that I receive. There are some days that I feel like I'm talking to an empty room, and it can be slightly unnerving to say the least. So when those of you that took a moment to indulge my self-indulgenceness yesterday, it really meant a lot to me. Thank you. This is true! It happened when Inara was a wee babe, about 4 months old and we were out in the boonies of Pennsylvania at a farm, enjoying the fall festivities. A little old lady came up to me and spoke in a very loud voice, in slllloooowwww words: "THAT. BABY. IS. BEAUTIFUL. WHO. DOES. SHE. BELONG. TO?" Ummmm...what the flip? I said that she belonged to me. She said: "NO. WHO. IS. HER. MOTHER?" And that's when Yousuf came up behind me, put his arm around Inara and I and said, "Hi honey, what's going on?". I turned to him with a shocked expression on my face, "This lady wants to know who Inara's mother is." Yousuf looked at her, saying very loudly, "This is my WIFE and that is our DAUGHTER." The little old lady looked like her head was about to pop off and she turned to her companion and said: "Oh my! Well I never!! I thought that was the nanny!" True story! Oh, and also? People are crazy. These go together, so I'll answer them both. I graduated with an Honors Bachelor of Science Degree from the University of Toronto a loooooong time ago. I'm old. My major was Human Biology and I double minored in Zoology and Political Science. Clearly I was confused about my life's direction even back then. Nothing has really changed. Who got these right? I think my sister in-law answered them exactly right but I think I fooled a few others...tee hee! This is also true. We moved around a lot when I was a child, and two new schools were built that I transferred to. It totally SUCKED. I never felt quite at home anywhere, it was almost as if I was always waiting for the other shoe to drop. It was hard for me to make close friends, but somehow I always found ways of fitting in - mostly by changing who I was on the outside. I don't think it was a healthy way to go through my formative years. But it did shape the person I have become, and surely that counts for something. I think. How is it possible that everyone got this one right? It must say something about how I ooze Geekery, even through the internets. How sad. This question is absolutely, unequivocally FALSE. Yay for me. True and true. I come from hardy South Asian stock, and it's a prerequisite of our ethnic group to have weddings that last many days. Oh, and you also have to invite everyone your parents ever knew since the day they were born. Your first neighbor when you immigrated to Canada? It would be insulting not to have them there. The corner store owner that once sold your parents milk in the middle of the night so that your mother could make dessert for her in-laws? You wouldn't be alive without that guy! He has to be there! And every friend, relative, friend of your relatives and relative of your friends that you know or have even heard about in passing must have a front row seat at the festivities. It makes for a very crowded ceremony. And it also freaked my poor, unsuspecting white in-laws RIGHT OUT. My dad kept dragging people over to their table and introducing them as "My plumber from 1983. He's like a brother to me!". They were very confused. I'm sure they didn't think that we were weirdos at all. Sadly, this is also true. Looking back, I did a lot of things to fool myself into thinking I was just fine without medication, but it just made everything worse. I'm still dealing with some of the side effects (like being a bit fluffier than I'd like to be), and I also don't know if I will ever be truly "well". A lot of bad shizz happened that is hard to get past and is hard for me to think about, even all these years later. However, instead of rubbing salt into the big, gaping, oozing wound that caused my depression in the first place, I feel that time has diminished it to a dull ache that I carry around and that flares up from time to time. I think it's more manageable now. I also think it would do me a world of good to see a therapist from time to time. This is a trick question. It's true but it didn't start out that way. The story is that when Inara was little we used to read a book together at bedtime that had a picture of a family standing around a little baby at the very end. And she would point to each of the people in the family and name them. She'd say Mama, Daddy, Nanu (that's what she called herself) for the little girl, Gammie for the grandma, and then for the baby she'd always point and say "Baby Nissa". We weren't at the point of talking about another baby yet, so it was just some strange weird thing that she did that we'd laugh about. Later, when I got pregnant and found out that we were having a baby girl, we'd always refer to her with Inara as "your baby sister", but she was all like Yeah. You mean Nissa. That's her name, dudes. Get with the program, already. And so we went through all the names we liked and kept coming back to Nissa. It sounded vaguely familiar to me, until I realized that my grandmother (who passed away in 2005) went by the name Sayeeda, but her full name was Sayeeda Vikhar-un-NISSA Begum (Capital emphasis is mine. She never spelled her name with random caps.). We don't know if Inara ever heard of me call her that (Unlikely, because how often do you say your deceased grandparent's full name?) or if it was some fated coincidence. All of a sudden, the name Nissa took on a much more significant meaning for me and I felt that this baby really really needed to have her great-grandmother's name. And then of course we couldn't leave out Yousuf's side of the family, so we gave her the middle name Aveline, which is a variant of Evelyn, which is Yousuf's much-loved and very much alive maternal grandmother's name. It was such a gift to see the moment of emotion dawning on her face when we told her the significance of Nissa's names. It miss my grandmother all the time, but that day the feeling tore through me like a current. 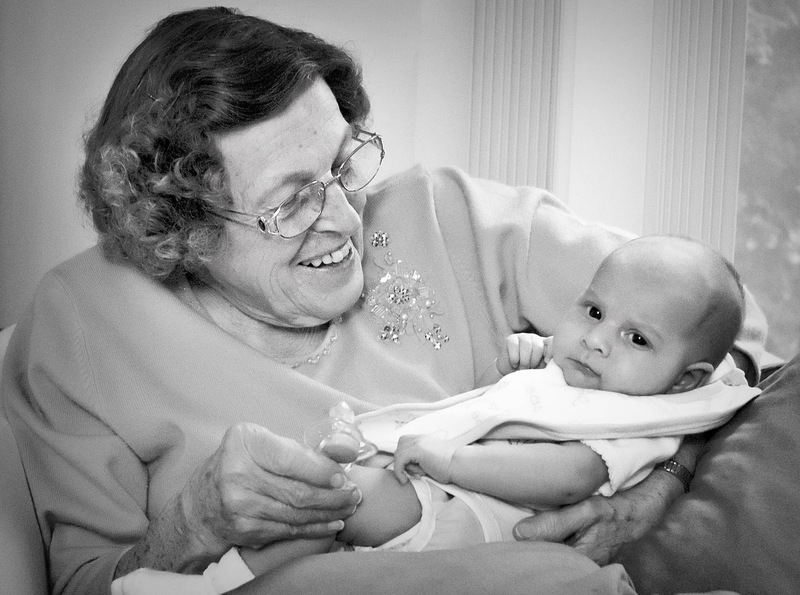 Here is a picture taken right after we told Great Grandma Evelyn about Nissa's middle name. Looking at it makes me feel so grateful for Nissa to have that connection to her past. This is false. And I know Ayesha left me a comment saying that if it was false then I would be a lot less cooler to her, but what can I say? I'm a Harry Potter geek, dude. Cool is not in my DNA. The truth is that Yousuf and I liked the name Inara waaaaaaay before we watched Firefly (which is only the most awesome show ever in the history of the entire universe), and we'd been mulling it over as a name when I was pregnant with Inara. I do think however, that watching Inara Serra in all her hotness sealed the deal for my husband - although for the life of me I can't imagine why it would be a good thing for us to name our child after a futuristic space "companion" - if you get my drift. In any case, we loved the name and we made it our own, and ever since then I've been having to answer this question from all the other GEEKS that I know and love. Yes, that means you too, Ayesha. Have a great weekend, friends. I'll catch you on the flipside.